This year, the faculty of law at the University of New Brunswick celebrates its 125th year. In honour of the milestone, over 350 alumni, faculty, students and guests attended a gala dinner last Saturday, April 21, at the Delta Hotel in Fredericton. Early in the evening, UNB Law alumna Madam Justice Margaret Larlee was presented with the prestigious 2017 Ilsa Greenblatt Shore Distinguished Graduate Award. Named in honour of the late Dr. Shore, a former UNB Board of Governors chair and graduate (BA, BEd ‘71, LLD ‘79), the award is bestowed upon UNB law alumni who have been involved in public service, including service to the law school, and who have achieved recognition in their chosen fields. In 1985, Madam Justice Larlee was the first woman appointed to the Court of Queen’s Bench of New Brunswick. She was also the first woman appointed to the Court of Appeal of New Brunswick in 1998. The Honourable H. Wade MacLauchlan, CM, OPEI, MLA (LLB 1981), Premier of Prince Edward Island and former dean of UNB Law, was the evening’s keynote speaker. 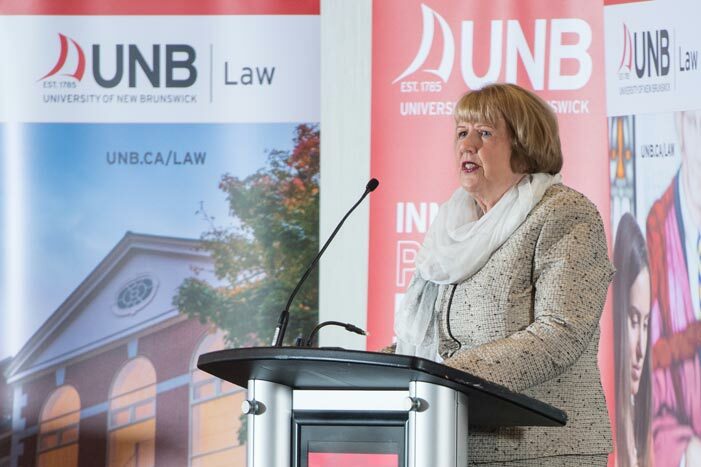 He spoke of UNB’s reputation for fostering tight knit relationships, and the significant impact that can make throughout one’s legal career. Other notable alumni in attendance included the Honourable Gerard La Forest, former justice of the Supreme Court of Canada, scholar and teacher; the Honourable Ernest Drapeau, Chief Justice of New Brunswick; and several former UNB Law deans, including Edward Veitch, Anne La Forest and John Williamson. Proceeds from the evening will go towards the Law 125 Opportunities Fund, and will help support future UNB law initiatives such as new courses, the expansion of internship and clinical experiences for students, and building and classroom improvements. Photo: Madam Justice Margaret Larlee accepting the Ilsa Greenblatt Shore Distinguished Graduate Award at the Law 125 Gala Dinner, Apr. 21, 2018. Credit: Cameron Fitch/Photo UNB.